What Cable Should I Use? Is DVR The Best Choice for Security Systems? When it comes to installing CCTV equipment, there are several things to consider: What type of cameras will work best for me? What type of DVR should I use? Should I go into IP cameras or regular analog cameras? Do I want a standalone system or a PC based system? Do I need infrared cameras or will non infrared cameras work? Do I want wireless or hardwired cameras? These are just a section of the questions that you should ask yourself. On my most recent camera installation, I went with an Ultimate Mini DVR, which is an outstanding standalone unit. I used a compilation of infrared and non infrared cameras. After weighing the pros and cons of wireless vs wired cameras, I chose to go with wired cameras due to their quality and heartiness. I chose to go with siamese cable over my other options. This solution is not going to fit all situations and here are the differences and benefits for all. If you are a novice installer or homeowner, a plug and play cable is the way to go. A plug and play cable is a pre made cable that has the BNC connectors and power ends already on the cable. There are pro and cons with this cable. If you are looking for a simple wiring solution this type of cable is a viable option. These cables are generally available in a variety of lengths and also available with audio included to make adding microphones to your system a snap. Typically with this type of cable you will have excess cable on your run, so the best thing to do is to coil the excess wire away from potential interference items. With a plug and play cable it is important that you keep these cables away from power cables, fluorescent lighting, and other higher power sources to insure a better picture quality. This is due to the fact that these cables generally are not manufactured with shielding in them, this is so they are more flexible and easier to maneuver. With the lack of shielding in the cable it is important not to drag these cables over anything otherwise your picture quality will suffer. When you are running a plug and play cable through a wall you will generally need a larger hole for the pre made connections to fit through, you will generally be able to slide the BNC connection through first and then follow it with the 2.1mm power connector. If you are a professional cctv installer or have experience putting fittings on cable this is the cable for you. A siamese cable generally consists of an RG59 cable with an 18/2 cable attached to it. The RG59 part of the cable is for transmitting the video signal from the camera to the DVR. The 18/2 portion of the cable is for getting power to the camera. The 18 stands for the gauge of cable and 2 stands for the number of wires associated with this portion of the cable. So an 18/2 cable has 2 parts that consists of 18 gauge cable. This gauge of cable is great for running either 12vdc or 24vac power to your cameras. 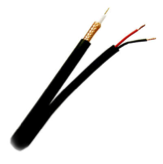 This cable is generally shielded to help prevent video degradation and interference from occurring. With siamese cable you will still want to avoid laying the cable on high power cables or fluorescent lighting. By laying any type of cable on these items, you are asking to have poor video quality. With siamese cable there are several things you need to think about, what type of fittings am I going to use?, what type of power source am I using?, and how is the cable going to be ran?. There are several types of fittings that can be used to finish off a siamese cable. There are crimp on, twist on, and compression. In each of these types there are several different variations. The most common fitting for a novice with few tools is the twist on connection. You will need a coaxial cable stripper to get the proper sizes of the core and shield showing, this is typically around a ¼” of each. Once you have the this done, you will want to take and peel the metal shield back to prevent it from making contact with the core. The best way to think about it is like peeling a banana. Once this is done you will then be able to twist the connector onto the cable. These connectors are great for a novice installer with minimal tools. The crimp on connectors start the same way as the twist on. Instead of twisting the connector on, you will have a sleeve that slides on first and then you will slide the end into place making sure that the shielding is on the outside. Then slide the sleeve up to the connector and with your crimping tool, crimp to secure the connector to the cable. This is a tried and true method of doing connections, it has been used since coaxial cable has been in use. The newest and most weather resistant connection is a compression fitting. This connection starts out the same way that the other connections do. The easiest way to make sure you have these connectors on correctly is to lay the connector on the side of the wire with the grooved part of the BNC at the top of the outer cable cover, where the shielding is peeled back. Mark where the end of the connector comes back to on the cable, you will want to get the connector on just about to this point. Keep in mind that the connector is not compressed so you may not make it all the way down to your mark, but you do want to be close without knocking the center pin out of the connector. This is the style of connection that all new cable and satellite television installers use, these connections are very durable and normally do and forget. The last thing you will need to complete your cable will depend on the type of power source you go with. There are either power distribution boxes or simple plug and play power supplies. The power distribution box is the typical power source for this type of cable. This is because you will take the raw end of 18/2 cable at the DVR side and attach it to the screw terminals on the box. On the end of the cable at the camera you will need what is called a flying power lead. This will allow you to attach the power cable from the distribution box to the camera without cutting the cable from the camera and potentially damaging the camera. This connector is a 2.1mm female plug with raw wire that gets crimped onto the siamese cable. If you go with the plug and play power source you will also need another connector this is a 2.1mm male plug with raw wire to connect to the siamese cable. Instead of the cable screwing into the terminals on the power distribution box you will be essentially making a plug and play power portion for the camera. You can use this same type of setup if you want to individually power your cameras, instead of having all of your cameras on a power distribution box. One of the newest ways of running cctv wire is with Category 5 cable, more commonly known as Cat 5e. This type of cable is commonly used in network applications, it is 4 pairs of twisted wire generally 24 gauge wrapped in a sheath. 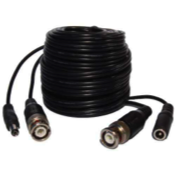 With this type of cable you will need a special adapter to connect to the cameras and DVR. These adapters are called Baluns. A balun typically utilizes 1 pair of the wire to transmit the video signal through. There are several of different types of baluns that can be used. There are passive and active, just video, power and video, or power video and audio baluns. You will use passive baluns on shorter cable runs and active baluns on runs of approximately 1000’ and above. With the passive baluns you can run power and video up to about 300’ without needing to draw your power locally at the camera. When you are using active baluns you will need a power source for the balun at each side of the transmission, as well as power at the camera side. The good part about wiring with Cat 5 cable is that when you are looking to upgrade your camera system to IP, the wiring is typically already done for you. So for anyone who is thinking about their security system in the future, I would suggest that wiring with Cat 5 is the way to go. With every installation will come a variety of questions in which you will want to answer before proceeding. When it comes to cctv installation there is not a one size fits all approach, l will typically feel the client out with regards to their future plans before deciding what cable will best fit their needs. When it comes to the hardiest and most tried and true type of cctv cable it is hands down siamese cable, the vast majority of existing cctv systems will have this type of cable and it has generally work for years and will continue as long as it was installed properly. The biggest thing to remember when running your cable is to try and avoid running cable, regardless of type, by any major power sources. This is one of the biggest mistakes that most people make. The best way to avoid most high power sources is to stay in the upper portion of the rafters, this may take a little more cable but will save you headaches in the future. Siamese Configurations and Paired Wires: I wanted to cover these first since the ideas of Siamese Cable, Siamese Configuration, and Paired Wire are applicable to all kinds, types, and gauges of wires. All these terms essentially mean the exact same thing. They all refer to a single cable that contains more than one wire. Closed Circuit Television (or CCTV) security camera installations typically use a three wire system. This system is commonly referred to as “Siamese Security Cable” or “Siamese Cable” and is simply 1 RG-59 cable and 1 18-2 cable (both explained below). Probably the most common cable joiners in the digital video security systems industry are BNC connections. BNC connectors are easy to use and ensure a sound, full contact connection. BNC connections are different than most other single pair wire connectors (such as RCA plugs, for example) plugs, becuase BNC connections are "locked" in place. The following article is about the origin and use (including applications) of BNC Connections.